Bob Cox directed the group from the front of the room. Many of the scouts were new to the instrument, so seniors lent them a hand when needed. The event was organized by Anne Marie Thompson, the Volunteer Coordinator for the Council on Aging, and Darci Rogers, the troop leader for the fourth-grade Girl Scouts. In the fourth grade, students at the Chickering Elementary School begin learning to play the ukulele. Meanwhile, the Council on Aging has a group of seniors who meet once a week to play ukulele together. 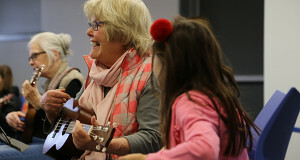 The idea was hatched to put together an intergenerational event where experienced seniors could help teach the kids what they know, and the group could sing and play their instruments together. The session was led by Council on Aging member Bob Cox, who stood at before the group with ukulele slung around his shoulder. With a white board posted with chord charts behind him, Cox set the tempo for the songs, stopped and started where necessary (“We’ve got some people learning here, still - we took off at the director’s pace on that one. Let’s try again.”), and led the singing and strumming for the group. 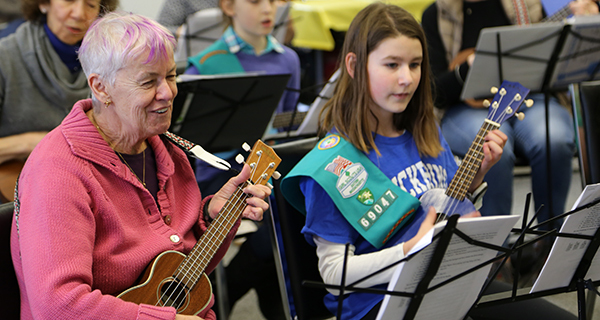 Each scout was paired off with a senior, and as they played, the more experienced seniors helped the scouts through the songs, offering advice and sharing laughs as they went. Paired off one to one, seniors and Girl Scouts sang and played ukulele together. Cox reached out to the Chickering Elementary School to get hold of the sheet music for the songs the students had played in class, and he brought some songs the COA group plays together. “They knew some songs, he brought some songs, and they all just played together,” said Thompson.